It seems we didn’t evolve into human beings in a smooth, seamless way, but more with a pattern of great leaps and long, slow changes. One of these great leaps was in the growth of the size of the brain. One of our pre-human ancestors, Homo erectus, had much smaller brains than we do, but over the course of 200,000 generations (2 million years), their brain size roughly doubled in size, taking them up to about the same size as brain as we humans have (since about 500,000 years ago). 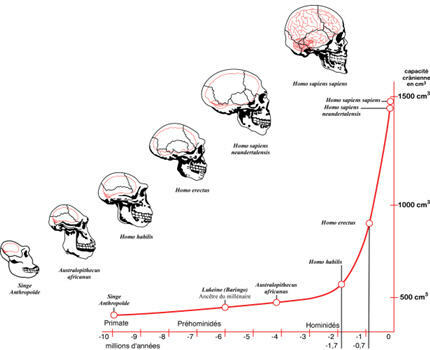 Interestingly, brain size in humans hasn’t increased over the last half million years (indeed it’s shrunk a bit! ), but what has happened is rapidly increasing asymmetries in the brain. It’s not just that our massive cerebral cortexes are asymmetrical, but within each area of the brain there are highly specialised areas. In other words, its a story not just of an increase in size, of adding more and more neurones, but of complexity. Here’s one of the puzzles about evolution though – how on Earth did brains evolve so quickly? You might say 2 million years doesn’t seem that quick but look at the speed of change. This is why some people refer to the growth of the human brain as the second “Big Bang”…….although I do like the idea of a “Great Leap”!